After delaying his pit stop as much as possible, Bjorn Wirdheim finally brought the No.24 Advan KONDO GT-R in for its routine stop on lap 31. This put Iguchi in the No.39 Denso SARD SC430 back in the lead. Iguchi continued to race on toward his first win, maintaining a lead of 3 to 4 seconds over the pursuing Tachikawa in the No.38 ZENT CERUMO SC430. Behind these two lead machines there was an intense battle between the No.12 Calsonic IMPUL GT-R of Tsugio Matsuda and the No.17 KEIHIN HSV-010 of Koudai Tsukakoshi for the third-place spot vacated by the No.36 PETRONAS TOM'S SC430 of Kazuki Nakajima when it lost speed. However, by this point the battle for the lead and the win had came down to just two machines, the No.39 Denso SARD SC430 and the No.38 ZENT CERUMO SC430. 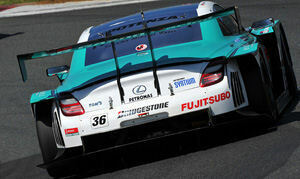 It appeared as if Iguchi in the No.39 Denso SARD SC430 would sail home to victory until a sudden tire burst on the No.36 PETRONAS TOM'S SC430 of Nakajima coming out of the last turn on lap 50 caused the latter to crash. This made the main straight a yellow flap zone and prevented Iguchi from passing the GT300 machine he happened to have come up behind. Due to this delay, Iguchi lost his lead margin all at once and now had the second-place No.38 ZENT CERUMO SC430 of Tachikawa right on his tail. 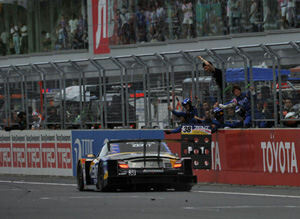 Now, the man long known as the "Fuji Meister", Tachikawa in No.38 ZENT CERUMO SC430, had the opportunity to prove he was worthy of the name and to end his dry spell here at Fuji Speedway over the last few years. Tachikawa made his move at the Coca Cola Corner of lap 53, charging in from the outside to pass Iguchi and take the lead for the first time. Iguchi continued to chase Tachikawa through the last lap until he had to slow for a backmarker at the Prius Corner and was ironically hit from behind by a GT300 machine, sending him to into a spin. This dramatic come-from-behind victory by the No.38 ZENT CERUMO SC430 finally gave the Lexus SC430 camp its first victory of the season, here on the Toyota home track. The time it took to recover from the last-lap spin dropped the No.39 Denso SARD SC430 to 8th place. Finishing second and third respectively were the No.12 Calsonic IMPUL GT-R and the No.17 KEIHIN HSV-010, while the No.1 Weider HSV-010 finished fourth and the No.100 Raybrig HSV-010 came home in fifth place. 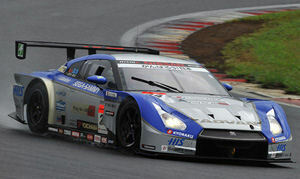 The ranking leader, the No.46 S Road MOLA GT-R, finished 7th but still managed to maintain its place at the top of the season ranking.